MechMod is a total conversion of the Half-Life engine and is based on Mecha or Mechs (note: You require Steam and a legitimate copy of Half-Life to be able to play MechMod Alpha). We have already released a primary Alpha 1.0 version of the mod, which was based on mechs taken from the Gundam and Macross/Robotech series. Alpha 1.0 was a 'test' release which the team put together while waiting for Half-Life 2 to go public, and the Alpha was also considered as a stepping stone towards something much bigger. MechMod stresses the importance of strategy, player reflexes, and teamplay all put together. Whether you want to play fast-paced or slow - MechMod has all the options available for you. The player has the ability to pick from different classes of mechs and customize them to his/her needs and desires. Our originally planned Beta version (for Half-Life 2 instead of 1) included designs for mecha customization, which would not only affect the aesthetics of your mech, but also the feel and usage of it. 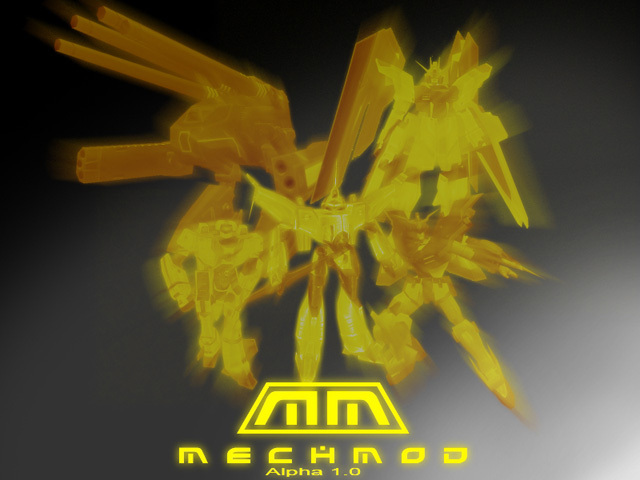 To find out more about how to play MechMod, the different mechs available, how to use bots, etc. refer to the manual found in the bonus folder of your MechMod folder (once installed). um i have a question how to install this into the non steam half life game? HOW DO YOU PLAY LAN.